Actress Samantha Ruth Prabhu is the epitome of bahu goals. The 32- year- old actress recently shared a rather fun photo of her, along with husband Naga Chaitanya and his mother Lakshmi Daggubati on her Instagram. She pointed out a serious case of unplanned twinning with a tongue-in-cheek caption that read, "Twinning with my MIL... walked out in the same outfit on the same day (no planning involved)... all the approval I need. Naga Chaitanya, men search for women similar to their mothers... suddenly this seems right." In the picture, both Sam and Lakshmi are seen wearing identical ensembles designed by Payal Khandwala. Actor Ram Charan's wife Upasana Konidela teased Samantha with a comment that said, "Perfect bahu". The picture was taken at Jaipur, where the family landed to participate in the wedding festivities of Aashritha, daughter of Venkatesh Daggubati. Chaitanya and the bride are cousins. Samantha posted multiple photos from the wedding, including a lavish food spread behind and celebratory decor. She also gave her followers the first glimpse of the bride and groom, Vinayak Reddy. From the pictures, it appears the Sam and Lakshmi managed to consult each other about their clothes for other functions as they strictly refrained from repeating the funny mishap. 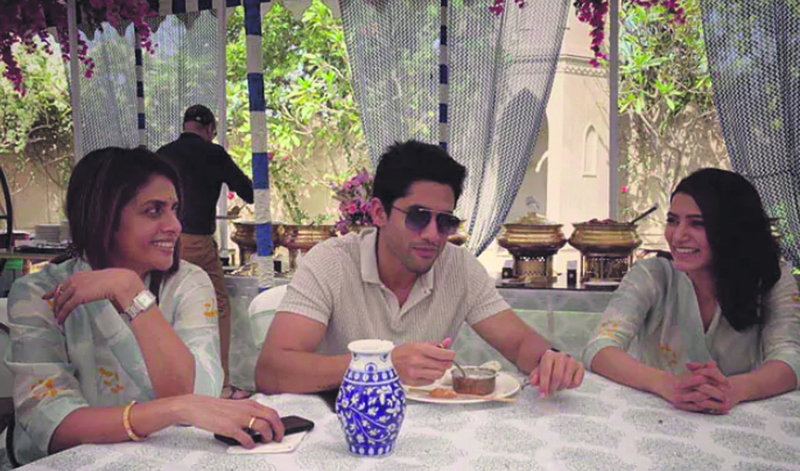 Naga Chaitanya is the son of Telugu superstar Nagarjuna and his first wife. Lakshmi is the sister of south superstar Venkatesh Daggubati and producer Suresh Babu Daggubati. Chaitanya, is also cousin to handsome hunk Rana Daggubati, who is Suresh Babu's son. His younger brother Akhil Akkineni is Nagarjuna's son with his second wife Amala Paul. Naga Chaitanya and Samantha Ruth Prabhu got married in October 2017 in two, South Indian Hindu rituals and Christian rituals.